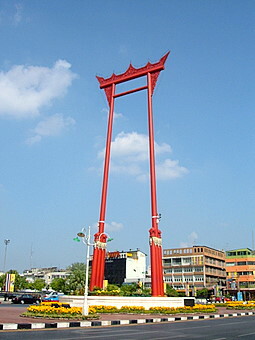 Wat Suthat Thepwararam is at the busy junction where the well-known Giant Swing and the Bangkok Metropolitan Authority are located. Though not as popular as some of the other temples in the tourist circuit, this temple has a far more impressive structure. A relatively quieter temple, without the usual throngs of tourists, the ambience within the walls is in sharp contrast to the hectic traffic outside. King Rama I started the construction of this temple in 1807. When the viharn or sermon hall was completed, the 13th century cast bronze Buddha statue from Sukhothai was installed here. 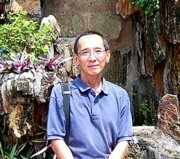 Picture at the top - the Giant Swing (Sao Ching Cha) just outside the main entrance to the temple. 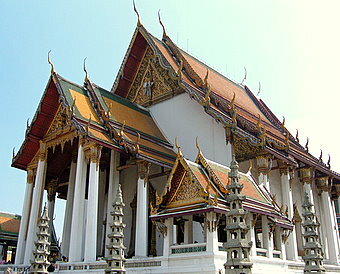 To get there, please see map to Wat Suthat. It is a neatly planned temple laid-out in concentric squares. An outer wall surrounds a gray slate courtyard around the main temple complex. A roofed inner wall, with arched entrances on each side, encloses the inner complex. Though expanded over the years, all the structures have retained a distinct matching design. The multi-tiered roofs, tiled in bright brown slate, have elaborate gilded wood carvings at the gables and chofahs or horn-like structures protruding from the ends. 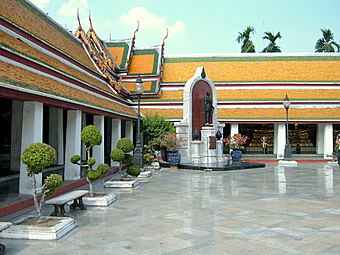 Within the inner wall is a wide courtyard, with well-trimmed trees, constructed during the reign of King Rama III, who continued with the expansion during his reign. The ubosot or ordination hall was started in 1834. When that was completed in 1843, it marked the final completion of the Temple by the Giant Swing, a royal undertaking stretching over three reigns. 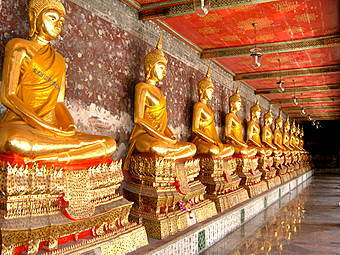 The cloisters in the inner wall are lined with 156 gilded Buddha statues, 2 m in height. 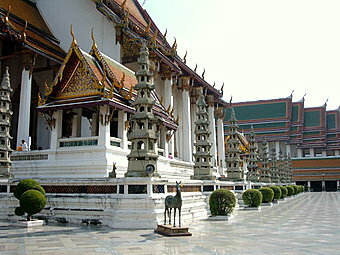 Twenty-eight Chinese pagodas, representing the 28 previous lives of Buddha, ring the viharn where the main Buddha statue is installed. 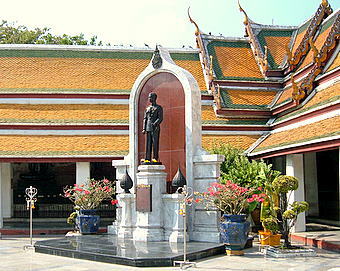 In one corner of the inner courtyard, stands a statue of King Ananda Mahidol or King Rama VIII, a poignant memorial to the young king who had a short and tragic reign. King Ananda had a strong attachment to this temple and his remains are interred at the base of the Buddha statue in the viharn.